This page provides a simple project demonstrating dynamic adjustment of the System Clock Frequency via modification of the System Clock Prescaler Register (CLKPR) on megaAVR® devices. 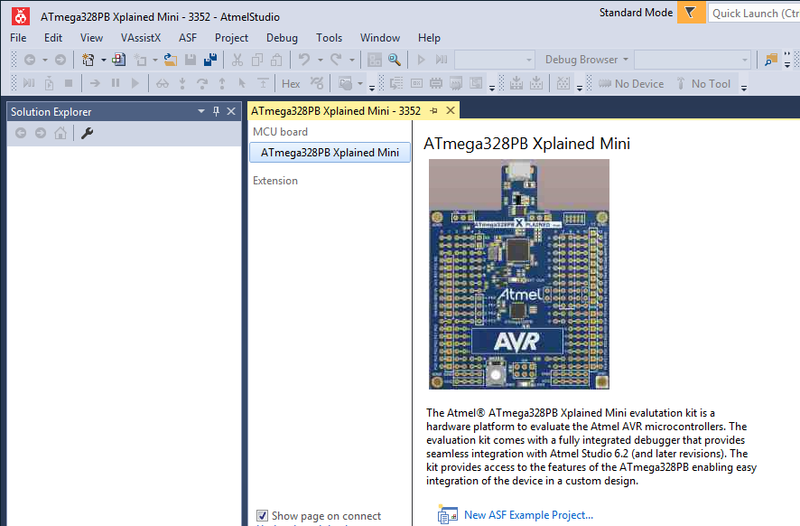 The code example runs on the ATmega328PB MCU. The System Clock Source is set via configuration fuse bits to be the external 16MHz clock provided by the mEDBG chip (see connection diagram below). The project configures the Timer/Counter1 module to operate in Clear-Timer-On-Compare (CTC) mode, and, on a period match, generates a "tick" interrupt every 100 mS. The timer clock source is configured to be SYS_CLK/64. The Timer/Counter1 ISR toggles LED0, and increments a Counter. The main program loop monitors the Counter value and updates CLKPR value every 10 seconds to dynamically change the SYS_CLK frequency. CLKPR is toggled between div/1 and div/4 setting, thereby changing the toggle (interrupt) interval from 100 ms to 400 mS respectively. This can be seen as the LED0 blink rate changes every 10 seconds. Review the project's main.c file for further detailed comments and description of operation. The mEDBG chip controls the programming/debug interface, as well as supplying a 16 MHz clock when the Xplained board is connected via USB cable to a PC. 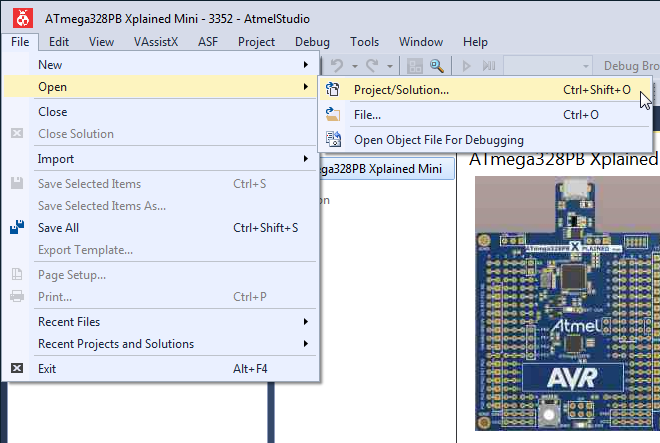 The target ATmega328PB CKSEL fuse bits are initially unchangeable on the Xplained Mini board from within Atmel Studio. 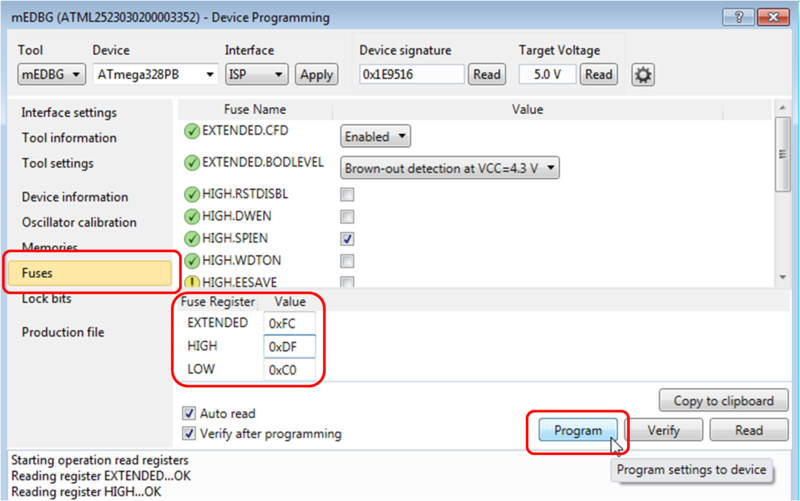 "Verification" errors will be displayed if programming CLSEL bits with any other setting other than "external clock". This may be overridden by clearing the mEDBG fuse filter as described in section 1.6.2 of the ATmega328PB Xplained Mini User Guide. The Xplained mini board is identified by the last four digits in its serial number (see sticker on bottom of board). 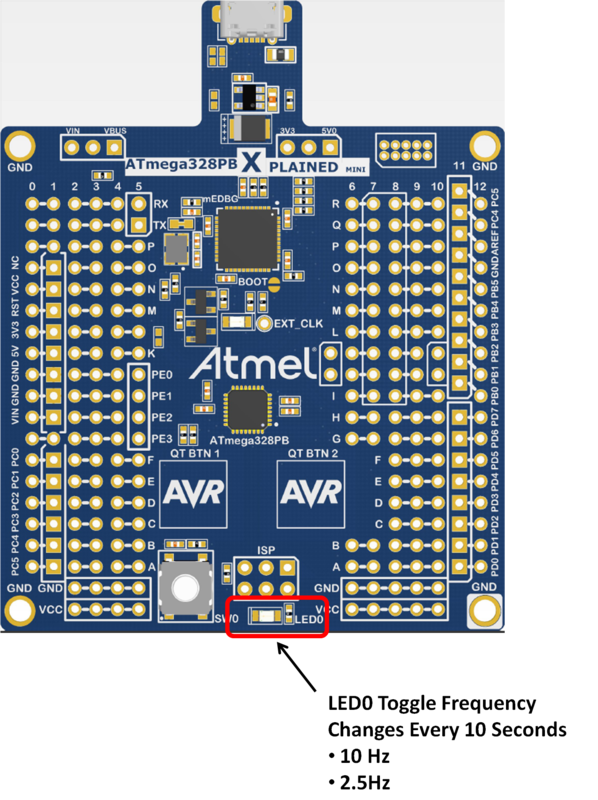 In the above example, the last four digits are "3352"
This project has provided an example of how to dynamically adjust the system clock frequency on the megaAVR® MCU.